The date was August 5, 2011 when Papa’s Freezeria launched on Flipline.com. It had been over a year since our huge MMO game Remnants of Skystone had launched and quickly failed. We were frantically working on games during this period, doing everything we could to keep Flipline afloat. During this small window of time, we managed to launch seven Flash games including Papa’s Freezeria. Work on Papa’s Freezeria started immediately after the successful launch of Papa’s Taco Mia! Once it was completed, we started looking for someone to sponsor the game before it was released. Around this time, large gaming portals would sponsor your game by giving you upfront money in exchange for their links and branding to appear in the game. This also usually included some period of exclusivity, where the game would only appear on the sponsor’s website before being available anywhere else. We were lucky enough to have Armor Games sponsor Papa’s Freezeria, who had also sponsored our platformer “Steak and Jake” the previous year. The idea for an ice cream based Gameria actually arose while brainstorming Papa’s Burgeria, though we made Papa’s Taco Mia next instead because we were still uncertain how ice cream would work. But with fresh eyes, we came up with the idea of combining two tasty ice cream treats: the sundae and the concrete. For those not familiar, a concrete is a treat in the US that is like a milk-less milkshake, blended with larger toppings, and eaten with a spoon. Concretes are great, but when put into the context of a game, it’s just mixing a few ingredients and blending. We decided to add an additional step where you are placing toppings on top of the concrete like a traditional ice cream sundae. From that idea, we created a perfect “blend” of sundaes and concretes that made the gameplay more entertaining, and the orders even more tasty and unique. Papa’s Freezeria’s big addition was the customizable lobby. Our previous Gamerias did have furniture, but the lobbies were pre-designed, and you were simply unlocking the hidden furniture. The problem with that system was the limited amount of furniture that could be brought. Once again, people found themselves late in the game, with tons of tips and nothing to spend them on. Now that the lobby was customizable, we could design a huge catalogue of decorations to put in the shop. Players could then pick and choose what furniture and posters they wanted to display. This ended up being a hit, and people were posting pictures, showing off their own unique lobbies in their games. This was by far the trickiest station to figure out. We spent a lot of time, testing different mechanics to get the blendable ingredients in the cup. At first, all the mixables and syrups were laid out on the screen, and you had to manually pick them up and squirt them into the cup. Initially we had a very complicated portioning system, where the larger the cup size was, the more scoops you had to put in. It was tedious, confusing, and was too similar to the Topping Station. We decided to scrap everything and speed up the process with the use of push-button machines. 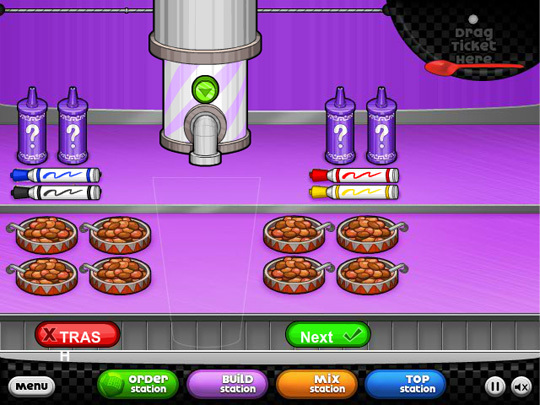 We added moving meters so that you had to time the button press in order to get the perfect portion of ingredients. And as a bonus, if you timed it just right, you would get extra tips from the machine. This added a unique and fun gameplay experience for the Build Station while speeding up the overall build time. Early Prototype of the Build Station with Taco Mia place-holders. At one point we thought it would be fun to draw on the cups. When Papa’s Freezeria successfully found a sponsor, we created a special version of the game that would be featured on their site. As was common at the time, the sponsor would have the game exclusively on their site for a while before other websites could show it. After this exclusivity period was over, we would release a second version of the game (called the “viral version”) that could be spread across the other major gaming sites and could be played anywhere. This viral version would also feature MochiAds in the game, which was an ad system we used at the time and was our primary source of income. Of course we didn’t want the sponsor’s version of the game spreading across the internet early, so we programmed the game to only work on the sponsor’s website. If someone tried to copy this game onto another website it just wouldn’t work, and they would have to wait until we released the “viral version” if they wanted a copy for their website. Unfortunately, as soon as the game launched on our sponsor’s site, a Chinese gaming site stole the game and hacked into it. They removed our site-locking code, so that the game would now work on any website (including their own) instead of being exclusive. This version immediately went viral, and spread across the internet. Even worse, we realized that while the hackers were removing our site-locking code, they also removed all of the MochiAds that would normally be shown in the game. We made Papa’s Freezeria with the intent that the ads in the viral version of the game would help pay for the time spent making it, and help pay towards us making other games. We were devastated. Within a day, the game was on thousands of sites illegally, and we were losing out on all the ad revenue we desperately needed to make. During this time we worked like crazy to contact each and every site owner, and inform them that they had an illegal version of the game and they needed to wait until August 5th to get a copy of the viral version. Some sites were really cooperative and removed it, but a good majority simply ignored us. Papa’s Freezeria turned out to be a fan-favorite Gameria. It was our first foray into sweet foods, and proved to be immensely popular. However, the launch of Papa’s Freezeria was disastrous thanks to the hackers, with tons of lost revenue and tons of stress. The launching of a game is the most critical part of game development, and Papa’s Freezeria’s taught us a lot. Papa’s Freezeria was the last time we looked for a sponsor (Cactus McCoy 2 sponsorship was already set up, even though the game launched later). After our experience with Papa’s Freezeria, we decided the whole process was far too risky for us. We wanted our future games to be released virally from the start, so the official game with ads could be spread immediately instead of giving hackers an opportunity to exploit a site-locked version, and cut us out of the equation. For the next Gameria release of Papa’s Pancakeria, we decided to go it alone and self-sponsor the game. At the time, this idea seemed crazy to other developers (and sponsors), but it ended up being the single best move we have ever made. When we started self-sponsoring, our website traffic grew exponentially, and the ads on our website were finally able to cover our development costs. This was huge because we were able to be truly independent. We didn’t have to worry about finding interested sponsors, or make adver-games for other companies. Now we could focus on creating the games we love to make and our fans love to play!